A delicious family tradition you'll love! 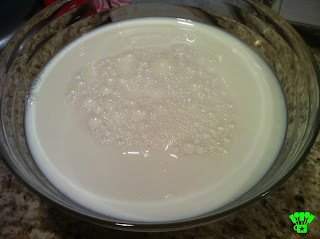 This simple, yet sweet easy egg nog recipe uses 4 ingredients to make a yummy alternative to store bought egg nog. Check out this recipe now, you'll be glad you did. Thanksgiving day is the "official" start of the holiday season in our house, or at least it was growing up. I think that's because Thanksgiving day was the first day my dad would break out the Eggnog. He would make up this yummy holiday drink and we would sit and watch the Macy's Thanksgiving Parade with the turkey and pies baking in the background. It is still one of my favorite traditions. Now that I'm the one making the turkey and other Thanksgiving treats, I don't get to sit and enjoy the parade as much as I used to. But I do still try and keep it on in the background and cook with a glass of eggnog in my hand. It's probably one of the easiest things that I make all Thanksgiving. Start by separating 2 eggs. 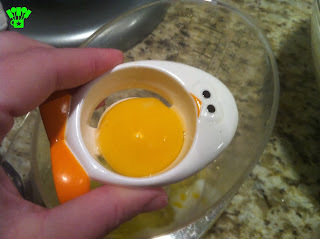 I've always had a hard time doing this, but we finally bought an Egg Separator and I can't believe how much easier it was. I highly recommend one if this is something you do often. 1 small package of Instant Vanilla pudding. 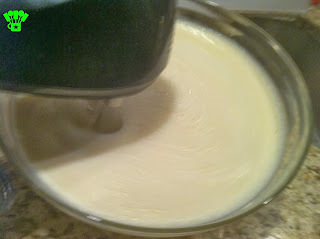 Blend the mix up very well. Mix well and add to the eggnog. 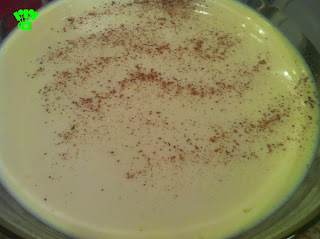 Sprinkle a little nutmeg on the top of your eggnog and Enjoy! This is not a very sweet eggnog compared to those that are sold in the stores. I think that's part of why I like it so much. In a way, it's more of a lightly flavored milk. 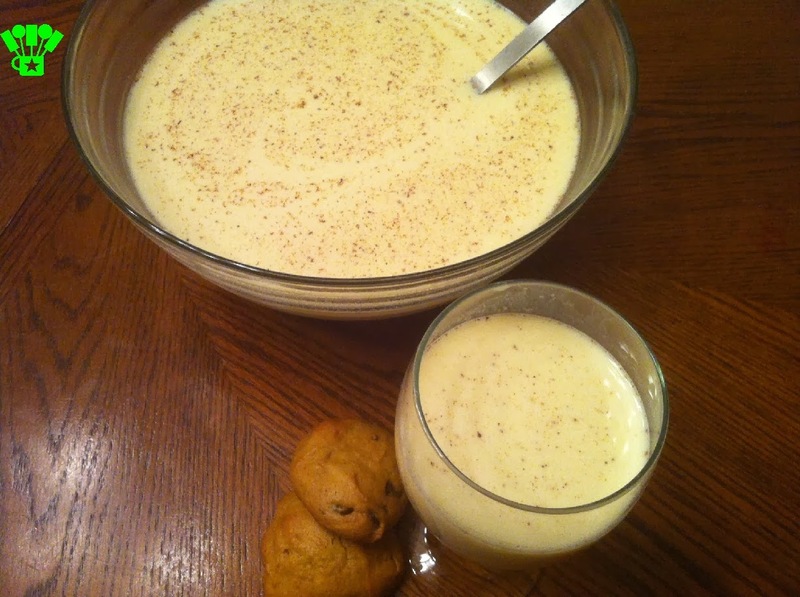 It goes perfect with some Pumpkin Cookies or Homemade Fudge and starts the holiday season off in the "right" way. Do you have a tradition that kicks off your Holiday season? 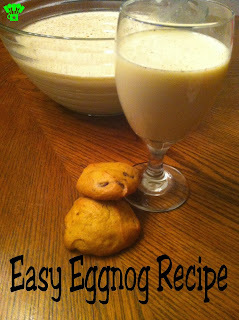 Here's the recipe and the Eggnog Printable Recipe. This look delicious! I love how easy it is. My sister once messed up egg nog so bad we didn't try it again. Now maybe I might. I can imagine that would be a pretty bad recipe to mess up and ever want to drink again. If I can make it, I'm pretty sure even your sister could! Let me know if you give it a try. 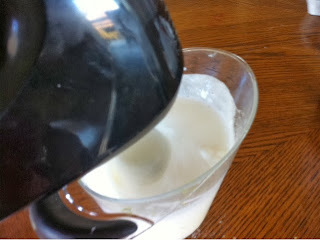 I always wondered how to make eggnog and if it really did have egg...now I know :) Thanks for sharing! This looks yummy. My mother in law makes egg nog milk shakes every Christmas while they decorate the tree. We have carried the tradition too, although I don't make it from scratch. Maybe I should try! I've always been a bit worried about the raw egg. Do you think I could heat it and then cool it again? I'll be honest I don't know about the egg. We've been making it for years and have never had a problem at all. I don't know if it's because it doesn't last more than an hour or two at my house or what. My hubby did make a shake with it this year and it was really good. I can see how it could be a family tradition worth keeping. Let me know if you try heating the egg. I'm super curious now. 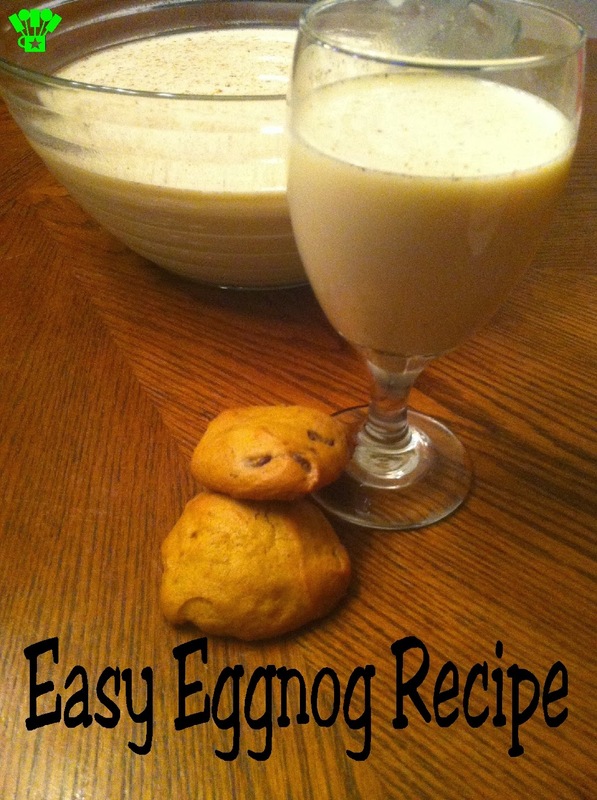 I should make this for the hubs--he is an eggnog freak! Thank you. Hi there! Wanted to let you know that I really enjoyed your recipe for eggnog and it was the #1 viewed link from last week’s Saturday Spotlight blog hop. It's been featured on this week’s blog hop which starts at 6am EST on Saturday, and will be PINed to my Pinterest page. Thanks so much for linking up! Looking forward to seeing what you have to share next time. Wow April! I'm so honored. Thanks so much for stopping by and letting me know. I'm heading over now to check it all out.